Unknown assailants have scrawled graffiti, including swastikas, on the walks of Joseph's Tomb in Nablus. Soldiers and worshippers arriving at the holy site on Wednesday night, exactly one year after the completion of its renovation, rushed to erase the graffiti. Shomron Regional Council head Gershon Mesika placed responsibility on the "Palestinian police terrorists." Some 1,500 people visited Joseph's Tomb in a special prayer organized by the Shomron Regional Council and the Shechem Echad organization in coordination with the security forces, ahead of Yom Kippur. When the first soldiers and worshippers arrived at the site, they immediately painted the graffiti in white and the prayer began. Selichot were said throughout the night in different Jewish versions, and the sounds of the shofar were heard across the West Bank city. Participants included Samaria Rabbi Elyakim Levanon and Rabbi David Dudkevitch of Yitzhar, who hosted the Rebbe of Volbroz, visiting from the United States. Council head Mesika responded to the vandalism at the site, saying that "only barbarians could do such a horrible thing. 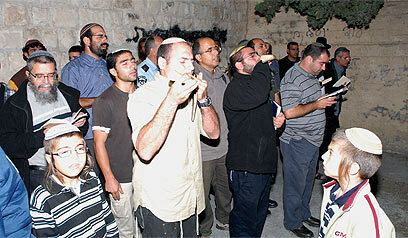 People capable of desecrating such a holy site in a pathological manner do not deserve to be called humans." Mesika added, "The Palestinian police terrorists, who tell the media that they are allegedly guarding the gravesite when IDF forces are not around, have lost all humanity a long time ago. "These are the same terrorists in uniform who murdered Ben Yosef Livnat, may God avenge his blood, and have now allowed the decoration of the Joseph's Tomb compound with graffiti of Nazi symbols." Mesika called on the IDF to return to Joseph's Tomb and resume the yeshiva activity there, in accordance with the "awful Oslo Accords". According to Mesika, "A nation must not allow the repeated desecration of its symbols and most holy sites." Rabbi Elyakim Levanon said, "About a month ago, they tried to intimidate the people of Israel with shocking accounts of an alleged 'black September', but we clearly saw that when the Israeli government demonstrates its sovereignty, all these threats disappear. "I call on the Israeli government to draw strength from the image of Joseph the Righteous and show Jewish respect and heroism toward those rising up against the people of Israel." 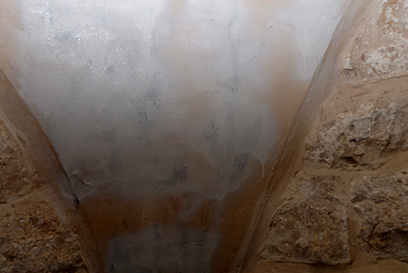 Israel's Chief Rabbis Yona Metzger and Shlomo Amar expressed their shock and disgust over the damage caused to the holy tomb. "It's unthinkable that the holiest sites serve as a target of revenge between religions," they said in a statement. The two called on all religious clerics to strongly condemn the incident and "instill in their followers feelings of respect for the values sacred to members of other religions." See all talkbacks "Swastikas spray-painted at Joseph's Tomb"